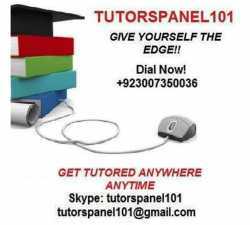 Pakistan> Punjab > Rawalpindi > Classifieds in Rawalpindi > Jobs in Rawalpindi > Education Jobs & Training Jobs in Rawalpindi > Online Tutor Provider For Foreign / Overseas Students Give Yourself The Academic Edge!! TutorsPanel101 is an independent, personalized and convenient online tutoring platform where our experienced tutors provide 1-On-1 online tutoring services for foreign / overseas students in particular, from school, O/A and post graduate level. Our mission is to provide world class tutoring service with special and dedicated attention to every student even if it requires our tutors to provide Free of Cost Extra Time! !till the point where our student feels comfortable with the online session’s content. Our experienced faculties are providing online demo classes at white board for all those requiring consistent tutoring services with the best and guaranteed results. i) Unlimited tutoring at an affordable price! Company Name: Home tution avaliable Home tution avaliable for 5 to matric fsc ics qualified teachers are avaliable..
Company Name: computer subjects any one wants home tution for his children on adyala road or on six road(muree road). any school going student. In this ad: I am offering a job Position Type: Full-time WE ARE LOOKING FEMALE STAFF IN OUR OFFIE ANY FEMALE WANT A JOB IN RWP AND ISB THAN CONT US. In this ad: I am offering a job Position Type: Full-time We need staff as teachers for our own company. Interested candidates mail cv or contact me directly if face any query related to this add Students can also apply. Promotion with better income, incentives and bright future. THE SHARP INVESTIGATIONS (PVT) LIMITED.